The liquid metaphor refers to software that operates seamlessly across multiple devices owned by one or multiple users. Liquid software architectures can dynamically deploy and redeploy stateful software components and transparently adapt them to the capabilities of heterogeneous target devices. The key design goal in liquid software development is to minimize the efforts that are related to multiple device ownership (e.g., installation, synchronization and general maintenance of personal computers, smartphones, tablets, home displays, cars and wearable devices), while keeping the users in full control of their devices, applications and data. 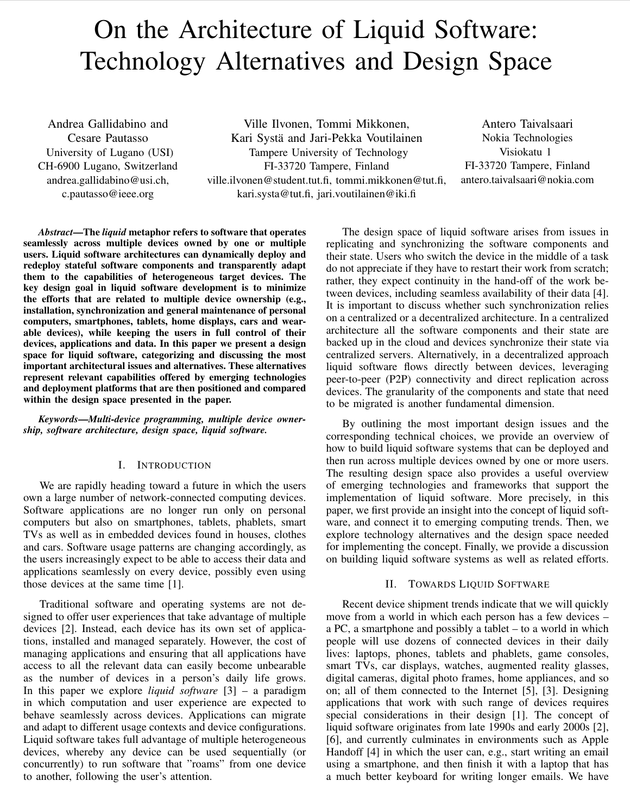 In this paper we present a design space for liquid software, categorizing and discussing the most important architectural issues and alternatives. These alternatives represent relevant capabilities offered by emerging technologies and deployment platforms that are then positioned and compared within the design space presented in the paper.